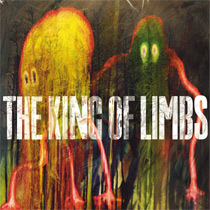 On Radiohead‘s new release, The King of Limbs, Thom Yorke sings from an almost carnivalesque standpoint, his perspective shifting without warning, resulting in a lack of cohesion and harmony for the listener. The irony is that, like all Radiohead albums, there’s definitely some underlying pattern here. The album seems very thematic, starting with its title, which conjures images that are primeval yet familiar, ugly yet beautiful, and sacred yet profane. And therein lies the dualistic nature of this album that perhaps makes it difficult to digest. The idea of uncertainty particularly comes into play with the lyrics. “Morning Mr. Magpie” refers to a bird that can be of good or ill fortune, depending on your beliefs. Other than the drumbeat, track four seems to reverberate nothing of its title, while in “Bloom,” the ocean could signify a positive change in scenery or a dive into the abyss. “Codex” echoes qualities of tranquility and mourning, while dragonflies can be of sinister or pure nature; even the “sleight of hand” could be a simple gesture or a form of deception. “Give up the Ghost” is probably my favorite track, alluding a sort of AM-radio sadness I find comforting. “Separator,” if indeed an interlude between this and the rumored second album, fits nicely, although the imagery in this song is still puzzling. Perhaps the most tangible song on this album is “Lotus Flower.” Following “Feral,” one might surmise that the song is hinting at innate desires that may seem insensible or foolish to others. Thom’s dancing alone on-stage in black and white, as well as the “cut me up” segment of the video in which his mouth stops moving but the record keeps playing, could also suggest an illusion of some sort. The song could also be referring to the seven centers of energy along the spine (chakras), and if so, wanting a “moon upon a stick” could equate to reaching the highest state of enlightenment in this process, with the moon being a head full of wisdom, and a stick being one’s now-inconsequential body. I couldn’t help but recall the video for “There There” (Hail to the Thief,) in which Thom’s inquisitive nature results in his transformation into a tree. In contrast, the “Lotus Flower” video portrays Thom not levitating like a God, but also not limiting himself to the motions of a robot; he’s moving as freely and uninhibitedly as he can within his limits of having only four limbs, portraying that we are not as chained to the Earth as we might think. Although the mind may naturally gravitate toward outer space, perhaps we should learn to stop filling our “fast ballooning heads” with knowledge, drugs, ego, etc., and instead release or “set free” the emptiness of the heart, which resides in the body that we’ve been given for a reason. As for “Little by Little,” the melody reminded me of some sort of Vaudeville snake-charming act, which is interesting when viewing the band’s recent press photo by Sebastian Edge. If they do indeed release a second half of this album, I’ll welcome it with open arms, although I’d love to hear these songs stripped down as well. As fans, we should simply be grateful this band is still producing music. And as always, no one really knows what these songs are about, except for maybe Radiohead.